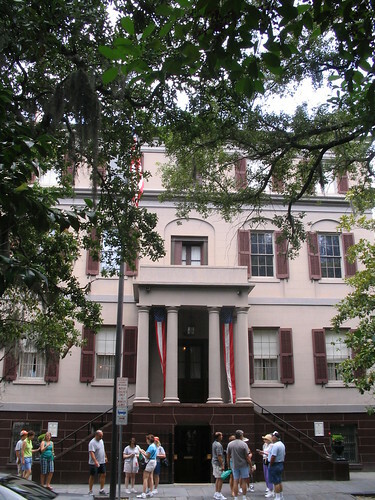 The Birthplace of Juliette Gordon Low, in historic Savannah. Juliette “Daisy” Gordon Low believed that all girls should be able to be physically active, mentally challenged, socially engaged, and spiritually fulfilled. In her day, many young women and girls lead isolated lives, spending most of their time at home. Juliette Gordon Low wanted girls to learn how to be self reliant and capable of working outside the home as well as inside it. Thus the Girl Scouts of America was born. On March 12, 1912, Daisy Gordon Low gathered together 18 girls in her home town of Savannah, Georgia, and began to realize her dream. By 1920, there were nearly 70,000 Girl Scouts in the United States; members had sold war bonds, worked in hospitals, and performed countless acts of community service. Today, Girls Scouts of America number well over 3.5 million. All three of our Savannah Vacation Rentals are located less than half a mile from the Juliette Gordon Low Birthplace, today a well-preserved historic building dedicated to telling the story of Juliette Gordon Low, the founder of the Girl Scouts. Whether you are in Savannah for a wedding at one of our Savannah Vacation Rentals, for business, or for pleasure, consider devoting a little time to learning about this fascinating women. Additional information is available at Juliette Gordon Low Birthplace. Please see Savannah Vacation Homes make a lodging reservation.